Work from home scams are populating the internet at an increasing rate and unfortunately many people are been roped into programs that are have little to no profit potential. This situation is truly getting out of hand and there isn’t much recourse for those who have fallen for these type of work from home scams. These unfortunate individuals will just have to take it on the chin as there isn’t any internet police that can help them out and in many cases the disclaimers and Terms of Service (TOS) on these sites protect the individual who is blatantly scamming individuals online. For this very reason people need to be more cautious when buying into money making programs online. Taking an extra few minutes to read the TOS can save you a great deal. Although there are many scams that are setup to blatantly steal people’s money there are also legitimate opportunities that are over-hyped and exude a false impression where people believe if they buy into the program they will begin making large sums of money instantaneously. The copy used on many sites is designed to grab people’s attention and to fill them with a desire for the good life – a life that can be achieved if you buy the program on offer. These types of offers are truly not pure scams as the information that you buy is usually genuine but in truth it is very difficult to make money with the information that is sold. It is easier to make money selling information to people on how to make money rather than applying the information itself – that is why there are so many people selling get rich quick programs and work from home information packages. The main reason why people are easily taken by these work from home and make money online scams is because of the attractiveness of working from home and earning a living from your PC. Who wouldn’t want to give-up their day job in exchange for a work from home opportunity? Then there others individuals like housewives who search for a way to earn some extra money from home or just to find something productive to do beside the usual home duties. All people are looking for is hope, hope for a better life, hope of doing something more meaningful, hope to be able to provide for their loved ones. Deceptive money hungry people from all over the world realize that many are in desperate situations seeking this hope and they prey on it and use underhanded marketing ploys to steal from the innocent. It is putrid to say the least as many people take out their last dime to buy into these programs and all they are left with is a package of information and a bitter taste in their mouths. But it must be said that people in general need to grasp the fact that there is no such thing as a free lunch. Opportunities that sound too good to be true are often just that. Using common sense and evaluating these opportunities from all angles is a necessity when you are about to spend money on something. “Secrets” and underground methods to make money online do not exist, the only way people succeed online and even offline is through hard work. Every person who makes money from home will tell you that it is not as extravagant as many perceive, in fact the pressures of working from home often exceed the pressures one will undergo in a conventional job. Real jobs are not easy to secure online and running a business online is as challenging as any other business. But there are many legitimate online jobs and opportunities and to find them you need to know where to look. Most of the information about these jobs can be found without any cost. We revealed many of these opportunities on our work from home page, and there a vast number of other legitimate opportunities online. 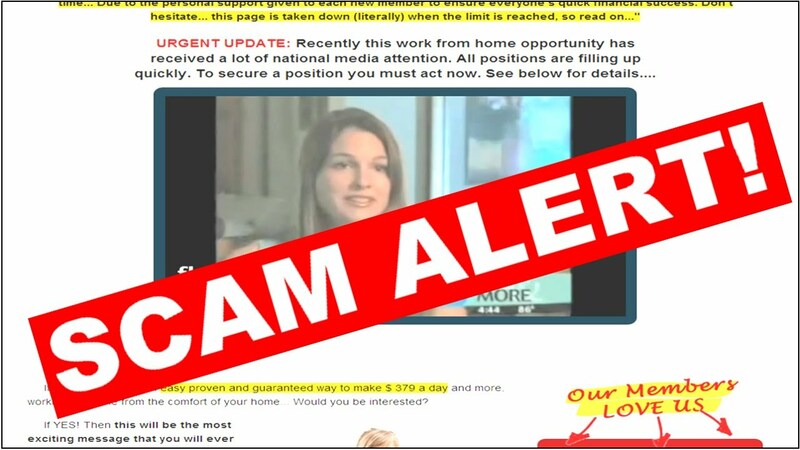 Yes, work from home scams do exist and these scammers have killed the hopes and dreams of many, which has made people cold toward the online opportunities as their perception is that it is all a lie. But this is far from the truth: the internet is a massive virtual economy where billions of dollars exchange hands everyday and the opportunities online are endless. The internet is a place where any person regardless of background, education or creed can come in and make a living. There are no boundaries online and offshore markets are made accessible to anyone from any part of the world. Not every opportunity is a scam – there are opportunities out there for you but you need to embark on a journey of learning to uncover the real, genuine prospects. Join a forum like the Warrior Forum, start reading a respected blog or invest in a legitimate online course. These portals and the course mentioned will help you begin to understand what this virtual economy is all about and once you understand the various methods to work online you can begin pursuing a career as a work from home contractor.